343 pages | 50 B/W Illus. The area of biologically inspired computing, or biological computation, involves the development of new, biologically based techniques for solving difficult computational problems. A unified overview of computer science ideas inspired by biology, Biological Computation presents the most fundamental and significant concepts in this area. In the book, students discover that bacteria communicate, that DNA can be used for performing computations, how evolution solves optimization problems, that the way ants organize their nests can be applied to solve clustering problems, and what the human immune system can teach us about protecting computer networks. The authors discuss more biological examples such as these, along with the computational techniques developed from these scenarios. The text focuses on cellular automata, evolutionary computation, neural networks, and molecular computation. 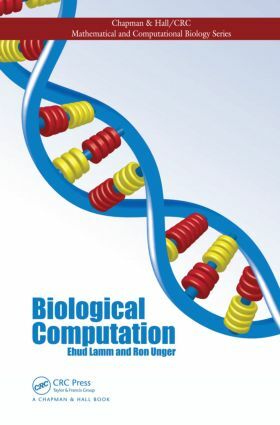 Each chapter explores the biological background, describes the computational techniques, gives examples of applications, discusses possible variants of the techniques, and includes exercises and solutions. The authors use the examples and exercises to illustrate key ideas and techniques. Clearly conveying the essence of the major computational approaches in the field, this book brings students to the point where they can either produce a working implementation of the techniques or effectively use one of the many available implementations. Moreover, the techniques discussed reflect fundamental principles that can be applied beyond bio-inspired computing. Supplementary material is available on Dr. Unger's website. Biological computing, the three-billion-year-old goldmine of information processing concepts, is ready for our educational mainstream. This beautiful undergraduate text by Lamm and Unger may be the first step. This book expertly presents fundamental concepts of molecular biology in its first chapter, and then goes on to develop many computing classics from biology. … I enjoyed reading this text. The exercises flex the imagination, the definitions are clear and precise, and the explanations are unusually powerful. I have been searching for a text like this for years, and now I look forward to using it. I read this book in one breath—it opens vistas on how the fields of computation and biology can inspire each other. I particularly enjoyed the analogies between immune systems and software that fights computer viruses. The book by Lamm and Unger methodically covers exciting developments in biological computation, offering for the first time a broad perspective of this important cutting-edge field of research. This is a wonderful treatise on bio-inspired computation, written from a computer science perspective. The authors are extremely knowledgeable about their subject, and the material they cover is both broad and deep. The book should benefit anyone interested in the connection between computer science and biology, a connection that is poised to become dramatically central to the science of the 21st century. A Summary, Further Reading, Exercises, and Answers appear at the end of each chapter. Ehud Lamm is on the faculty of The Cohn Institute for the History and Philosophy of Science and Ideas at Tel-Aviv University. Along with his co-author, he previously developed a course on biological computation for the Open University of Israel. He earned his Ph.D. in philosophy of science from Tel-Aviv University. Ron Unger is a professor and head of the computational biology program at Bar-Ilan University. His current research is focused on protein folding models, genetic algorithms, analysis of biological sequences, and noncoding RNA molecules. He earned his Ph.D. from the Weizmann Institute of Science.